Raghunatha dasa Gosvami, who later became famous for his renunciation, was previously a householder and wanted to join the personal association and service of Chaitanya Mahaprabhu at Jagannatha Puri. However, his father prevented Raghunatha dasa from doing so. After several failed attempts, Raghunatha dasa heard that Nityananda Prabhu had arrived at Panihati. In order to receive the Lord’s causeless mercy, Raghunatha dasa went to see Him. When Nityananda Prabhu saw Raghunatha dasa, He ordered him to prepare and serve all His associates chida-dahi, flat rice mixed with yogurt. 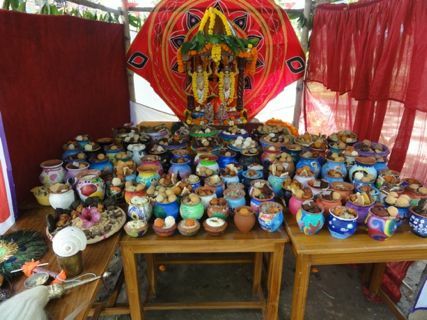 In order to please the Lord, Raghunatha dasa immediately carried out His order by preparing and distributing large quantities of chida-dahi to the Vaishnavas, as well as hundreds of others who had arrived on the spot upon hearing that a festival was on at Panihati. Finally, Lord Nityananda blessed, and ordered His associates to bless, Raghunatha dasa, that he would be successful in attaining the personal association and service of Chaitanya Mahaprabhu. prasada (sacred food) distribution to the thousands of pilgrims who arrive for the festival.